It’s human nature to want something for nothing. For those of us with a limited income, the need to keep down travelling costs is paramount. Here you’ll find suggestions to help you keep your food bill to a minimum when hitting the road. I recently ran an editorial about a couple who are on the road as often as possible and managing to save on the pension. It got me wondering how they did it and it occurred to me then that we should ask the experts: you. Write to us and tell us your best tips for eating well and saving money while you're on the road. The writers of all the top tips — those we publish — will get a great prize as a thank you present. See the bottom of the page for details. Meanwhile, we've compiled some budget tips for travellers to get you thinking. Buy what's good and fresh and locally produced at roadside stalls or farmers' markets. If it's good food, you can make a little go a long way. Gear up, get the permits you need to legally fish for your supper, and get out to the coast to fish for gill fish or head to the rivers and lakes and catch your own. Always ensure you have a permit and be aware of any catch limits. And never take more than you need. Foraging for food is an art we should all cultivate if we want to save money. I struggle to drive past a rogue fruit tree on the roadside with fresh, sun-ripened fruit free for the taking. We've all seen them: the self-seeded apple trees, plum trees, and peach trees beside the road. But there are plenty of other ways to get free and cheap. Look out for citrus trees where fruit laying on the ground signals it is obviously surplus to requirements. Homeowners may be only too delighted to let you help yourself to some grapefruit if you ask politely, especially if you offer something small in return by way of barter. Also, look out for wild mushrooms you can clearly identify as edible, or pick some rosehips or elderberries to make into a quick cordial. Pot up some herbs, flowers, or Mesclun mix to pepper up your next meal. Stow them away safely when you're on the road and bring them out to water and harvest when you make camp. I love the ready-to-grow ones from the local garden centre. They last well in their larger pots, but you could just as easily sow your own for a fraction of the cost. And don't forget how easy it is to grow your own nutritional beansprouts in a jar. If you love yoghurt, make your own from one of the reputable fast and easy mixes. I love Easi-Yo Greek-style yoghurt, but you'll no doubt have your own favourite. It's easy as to make and cheap as chips. Plus you'll have the added benefit of recycling the container. And if you like to make your own soft cheese, or labna, it couldn't be easier — simply tip your freshly-made yoghurt into a muslin cloth hung inside a screw top jar until all the liquid drains away. This is a great substitute for cream cheese. Make your own easy bread rolls, flat breads, and fruit cakes to take on the road, and if you're a dab hand at making lemon butters, jams, condiments, or relishes, you'll appreciate these zesty touches of home when you're away. If you love butter, but want it to be spreadable, make your own by whipping up butter with a bit of olive oil, or a drizzle of warm water in your blender before you leave home. 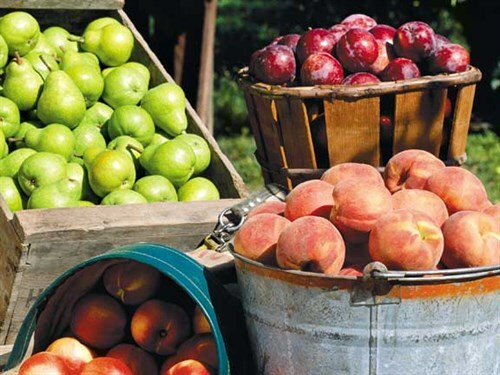 Pick your own seasonal fruits, nuts, and vegetables direct from the farm and you'll enjoy gourmet foods at a fraction of the cost you'd pay a retailer. You can also catch your own at many of the fish farms around the country. Do your homework before you get there and find out what regional specialities you can find at the farm gate or cellar door. Look out for cheap wine, cheeses, cured meats, olive oils, and home-made cordials, chutneys, or relishes you can buy direct. We know you don't have all that much room in your cupboards, fridge, or pantry when you're in your caravan or motorhome, but if you travel in tandem with friends, why not club together to buy in bulk and divvy up the goodies, be they bulk flours or grains, cleaning products, dried fruit, nuts, or a home-killed sheep or lamb. Sometimes you can enrol in a cookery class and learn to how to make your own sausages and small goods, cheeses, or chutneys, and get great deals from the cookery school which make it not only a fun way to upskill but which also makes good sense and good savings. Road Trip This last hint may seem like a shameless self-promotion, but it also makes perfect sense as we've compiled a 268-page book crammed with hints on what's best to buy in each region. And it's only $14.90, so you'll save a great deal more than you spend.